U.S. Assistant Secretary of State for African Affairs, Ambassador Tibor Nagy, addresses a press conference in Abuja on November 10, 2018. 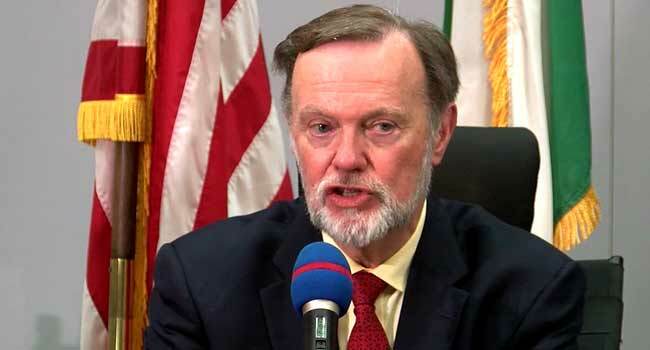 U.S. Assistant Secretary of State for African Affairs, Ambassador Tibor Nagy, disclosed this during a media chat on Saturday in Abuja, the nation’s capital. This comes as concerns grow in the West over China’s increasing influence in Africa. The Asian country has been the largest trading partner for Africa for nine consecutive years, exceeding $98.8 billion in the first half of 2018. Ambassador Nagy explained that the fund would be made available in the next fiscal year. The post U.S. Unveils New Policy To Boost Investment In Nigeria, Others appeared first on Channels Television.